Tree farming has been such a large part of my life for the last 30 years that sometimes I forget not everyone understands what it is and what it involves. When I tell someone I manage our family tree farm, I usually get a blank look and a comment to the effect, “THAT’s got to be the easiest job in the world.” I might as well tell them that I work for the highway department watching center-stripe paint dry! And every December, I have to explain that no, we don’t have Christmas trees (unless you want to hang tinsel on a walnut tree). With a full-time job, I spend less time working with trees than I’d like, but I do some planting, pruning, thinning, and even some salvage harvests. One of my more pleasant and productive tasks is running a small sawmill. Like most woodland owners, I knew the irony of having trees all around me, but going to the lumber yard for building materials that are lower in quality and higher in price. Operating my own small sawmill has been a long-term goal, ever since I helped mill posts and beams for our home a little over thirty years ago. Working within a foot of the exposed drive belt and spinning 5’ saw blade that stopped only at the end of the day, I shoveled sawdust, helped turn logs, and offloaded the slabs and lumber. When I pulled in the driveway with a load of wood for our new house, every muscle ached, my nerves were on edge, and my ears were still ringing from the roar of the unmuffled Detroit Diesel engine. But the best part was the satisfaction of participating in every step of construction, from felling the tree to driving the nails. When small band sawmills became available, the crazy idea of running my own sawmill was within reach. With the assurance that I would finally finish the house we had been living in for the last fifteen years – and knowing that I’d probably get one anyway – my wife, Becky, gave the purchase her approval. Since then, I have milled miles of railroad ties, barn siding, trailer decking, specialty lumber for area woodworkers and artists, and house flooring – for other peoples’ houses (we’re still walking on the plywood subfloor). 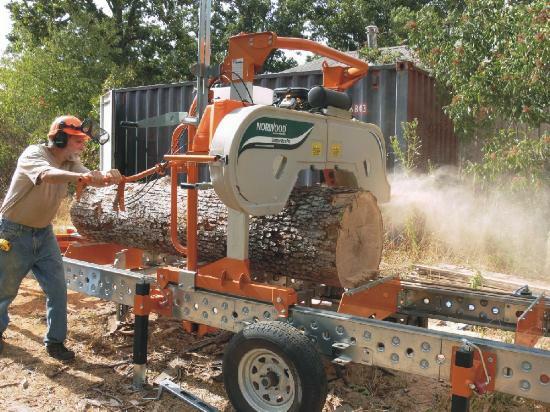 The Norwood HD36 portable sawmill I currently run is a manual portable band sawmill. Picture a shop band saw on steroids, turned sideways, and you get the idea. The engine, drive belts, and blade ride down the track on a carriage as it makes a cut. Adjusting the height of the blade controls the thickness of the boards. Moving parts are well guarded, and the 23-horsepower engine is quieter than a garden tractor. Manual sawmills rely on the sawyer’s muscle for log handling (loading logs on the mill bed and turning the logs), clamping the log down, and feeding the bandsaw blade into the wood. With the help of a hand winch, a good cant hook, and a little practice, it is much easier than you might think. The engine automatically throttles down and a brake engages to stop the blade when not cutting wood. Besides the safety factor, this feature helps bring fuel consumption down to around three gallons for the 1,200 board feet of hardwood I can cut in a day, if the logs are all arranged and ready to go. The trailer package allows me to tow the 1,800-pound machine behind my truck for sawing jobs and demonstrations at other locations. Norwood also offers track extensions for cutting long timbers of any length. In fact, I recently talked to a sawyer with enough track to cut 36-foot-long beams. Hydraulics to assist with sawing and log handling can be added onto the Norwood mill, which is an attractive option. I’m not getting any younger, after all. The rule of thumb is that the value of wood doubles with every process. For example, a board foot of oak that brings 20 cents on the stump is worth 40 cents delivered to the mill, 80 cents as rough lumber, $1.60 kiln dried, and $3.20 as tongue & groove flooring. Double that figure for cherry or walnut. I’m one of my own best customers for lumber, as there are always projects requiring lumber. Instead of buying pine at the lumber yard to re-deck my 16-foot flat-bed trailer, I culled out some post oak trees, milled the logs into 1-7/8-inch thick boards and installed trailer decking that will likely outlast me! Other projects include fencing, sheds, a barn, and some (very) rustic furniture. A guesthouse is high on the priority list for when family comes to visit. The sawmill opens up a host of new harvesting options. The wood left behind by logging crews is often more valuable that the wood taken out because of its unique character. Red elm, for example, could easily be mistaken for an exotic hardwood from South America. Sycamore, generally considered only suitable for pallets, rivals walnut in value when quarter-sawn on the mill. By emphasizing the uniqueness of my wood, customers see “character” where commercial mills see “defects.” This increase in value makes it more feasible to use selective cutting practices, and gives the option of allowing superior individual trees to continue to grow, while harvesting the “weed” tree next to it. Instead of “cut the best and leave the rest,” our harvesting philosophy is “worst first.” Hopefully, after a few hundred years of this management, our patch of high-graded woods will again have the diversity and beauty of its former years. The Norwood mill handles a variety of sizes and shapes of logs. Any sawmill can slice up a nice straight 10-foot-long, 20-inch-diameter walnut log. But what is in that crotch just above the log? Most loggers leave it behind to rot. But with a little care, a small band sawmill can convert it into book-matched flitches that cause woodworkers to pull out their checkbooks and ask, “How much?” The most challenging milling I’ve done so far was on the other end of the log. The exposed roots of trees that have been blown down or bulldozed down have immense potential. Clamping them down for milling calls for some real ingenuity, and embedded rocks will destroy several band saw blades. However, the wood has the deepest color and most depth to the grain pattern of any wood I have ever seen. Not all of the lumber I cut comes from our patch of woods. I have also cut “urban logs” from yard trees that have died or blown down in peoples’ yards. Some had sentimental value to the owners, and they wanted to make furniture from the wood. Other folks just don’t want to see their tree get ground up for mulch, cut up for firewood, or hauled to the landfill. I have also salvaged logs from land-clearing operations and storms, including the 2011 Joplin, Missouri tornado. This is where portability really comes in handy. I have actually backed my Norwood sawmill into driveways right in town to mill a few logs, without even unhooking the mill from my truck. Sawmilling runs the gamut from weekend sawyers who cut for themselves when they feel like it, to successful full-time businesses that employ a dozen people. With an initial investment of about one-third the cost of a new pickup truck, low maintenance, and operating expense of around 8 cents per board foot, I was able to start a small business that can expand if I decide to go into sawing full time. The internet is a great place to get information about sawmills. Norwood’s web site, NorwoodSawmills.com, provides information about their mills, as well as a link to their portable sawmill forum, Norwood Connect. A couple of other good web forums are woodweb.com and forestryforum.com. Foresters, sawyers, and woodworkers from around the world participate, asking questions and offering their opinions. If you happen to see any posts from “Post Oakie,” you’ve found me! Independent Sawmill & Woodlot Management magazine also runs reviews on sawmills and other wood-harvesting and processing equipment.